My name is Kurtis Albertson. I was born in Kirkland general hospital on the east side and raised in the Seattle area. After working in several different types of construction, I started roofing in the fall 1979. I worked for a small company. There were five of us that made up that roofing company. We did a lot of shake roofs, composition roofs and hot tar roofs. And a small amount of a new type of roofing, that had just come out in the market. It was and is called torch down roofing. 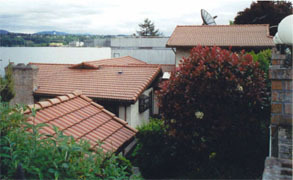 We did primarily residential roofing with some commercial roofing. I worked in the residential market in king county and Snohomish county for the first five years of my roofing career. In about 1984 I started working for what was then, one of the largest roofing companies in the state of Washington. We did primarily commercial jobs with some residential. I worked in that large company for another five years doing mostly government contract work. Schools all over the state of Washington, Monroe penitentiary, Kent city jail, West Seattle treatment plant, Ellensburg collage, metro pump stations, ext. These were large very complex projects. We used a verity of materials from torch down to single ply synthetic roofs like rubber (EPDM) and PVC (TPO was not on the market at that time). We did hot tar, cold tar, spray on roofs, sloped Styrofoam system, poly-Iso insulation. Every job had its own unique peccadilloes to work out. I then went to work for a small residential company as superintendent. After working in a large company For five years I began to feel lost and unappreciated for my efforts. I enjoyed working on residential, I received a greater sense of accomplishment, and felt I was actually working for a customer rather than a faceless government. I helped the owner of this small company with the day to day working of the business and ran the flat roof portion of the company. I did this for four years. After fourteen years of working for someone else I then went out on my own. I started Albertson roofing in 1993 and the company took off from day one. I had plenty of work and working with a home owner or a contractor was—and is—very fulfilling. The past twenty six years have flown by and I have thousands of satisfied customers and I’m looking forward to helping thousands more in the years to come.